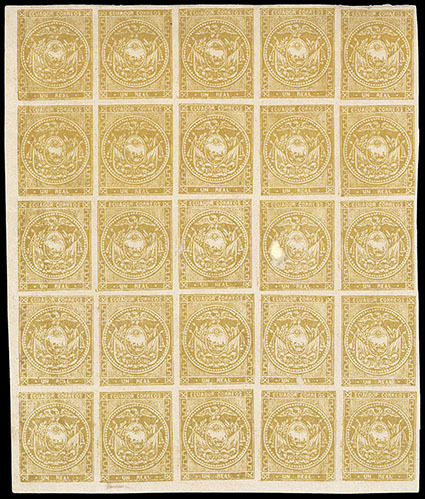 Ecuador, 1865, 1r Yellowish Olive, bottom left corner margin block of 25 (positions 46-50//82-86), prominent flaws include 47 without top frameline, position 73 with "RCAL" for "REAL", position 77 with large colorless dot at left of coat of arms and position 86 with right bottom corner damaged, without gum, small internal hole affecting position 67, horizontal crease between and below the second and third rows, couple small surface scuffs, F.-V.F. appearance, one of the largest recorded unused blocks in the olive shade, ex-Lund; with 2013 Moorhouse certificate. Scott No. 3 Estimate $2,000 - 3,000. 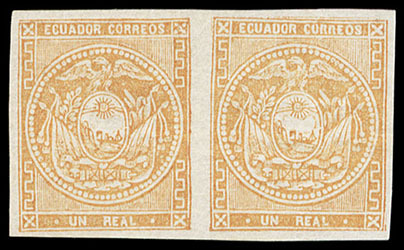 Ecuador, 1865, 1r Yellow, seven singles and two pairs in shades; includes first period colors of yellow, orange (pair) and chrome yellow orange, second period in bistre, olive yellow and chrome yellow and third period in light yellow buff, dark yellow buff (pair) and orange brown, o.g. except two later singles, full margins, Very Fine, some scarce shades. Scott No. 3-4 Estimate $100 - 150. 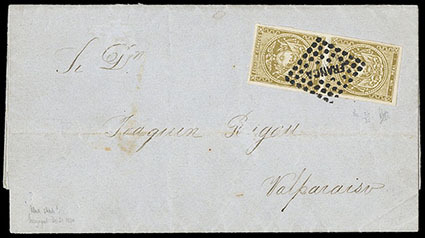 Ecuador, 1865, 1r Deep Olive, Vertical Pair, positions 26 / 35 from the 1868-71 printings, ample to mostly large margins, tied by bold "Franca" in dotted lozenge cancel of Guayaquil on 1870 folded letter to Valparaiso, Chile, Very Fine and choice, a very uncommon shade; with 1990 Holcombe and 2011 Moorhouse certificates. Scott No. 3 Estimate $500 - 750. Ecuador, 1865, 1r Yellow Olive, clear to large margins, tied by red "Pujilí, 6 Nob, 71" cds with second strike alongside on Judicial cover to Quito, manuscript "1¼" oz weight notation at upper right, Very Fine, ex-Hubbard and Lund; with 2013 Moorhouse certificate. Scott No. 3 Estimate $1,500 - 2,000. ONE OF THREE COVERS KNOWN WITH THE SMALL TOWN CANCELLATION OF PUIJILI. Ecuador, 1865, 1r Dark Olive, in combination with 1865 ½r blue on Judicial wrapper front and part backflap to Guano, tied together by Riobamba cds, manuscript "3 oz" weight notation at upper right, Very Fine, this shade is most unusual in the third period of printing. Scott No. 3+2 Estimate $200 - 300. The olive shade was the result of the mixture of some of the green and yellow inks used to produce the 1r issues. Both stamp were produced by using the same printing plate.